Lonnie Wheatley, HAUBSTADT, Ind. (July 16, 2016) – Another night, another stunner on USAC’s 29th Annual Indiana Sprintweek. And it seemingly gets more stunning by the night, with Carson Short pulling off the biggest of upsets by capturing his first career Sprint Car feature win in Saturday night’s 30-lap feature at Tri-State Speedway. 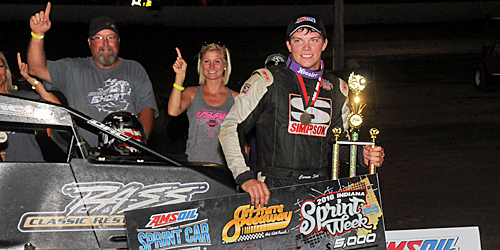 With the triumph, Short became not only a first-time Sprint Car feature winner but is the fourth first-time USAC Sprint Car winner of Sprintweek through six rounds of competition. 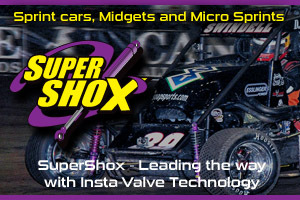 After taking off from the pole position early on, Short worked through traffic brilliantly over the closing rounds to fend off Tri-State Speedway aces Kyle Cummins and Chase Stockon for the $5,000 triumph and became the sixth different winner of the week as well. “This is unreal,” the driver of the RASS Classic Restorations/Inspection Lane Services No. 21 DRC said in victory lane. Short joined Tyler Courtney, Kyle Cummins and Brent Beauchamp as first time USAC Sprint Car winners this week with Bryan Clauson and Brady Short also capturing Sprintweek wins with the final round of competition remaining on Sunday night at Tri-State Speedway. Starting from the pole position, Short jumped into the lead from the pole position at the drop of the green flag and weathered just one caution flag along the way to take the victory. Cummins battled past Jarett Andretti for second in the opening handful of laps and chased Short through traffic over the final half of the race on the exceedingly well-manicured surface. Short made no mistakes, unassisted or otherwise, to keep Cummins at bay in the closing rounds as well as Stockon, who worked on Cummins for second over the closing laps to no avail. “We were working so well on the bottom and I was almost surprised at how good we were able to get through traffic,” Short said of the latter circuits. Robert Ballou charged from 16th to seventh in the opening handful of laps before ultimately working his way up to fourth by race’s end to earn Hard Charger honors for the second night in a row with Andretti rounding out the top five as Critter Malone was in the mix with a run from 14th to finish sixth. Qualifying Moments: Seventh to hit the clocks, New Mexico’s Hodges set Tri-State quick time for the second year in a row during Sprintweek. Heat Winners (starting position in parentheses): Robert Ballou (2), Thomas Meseraull (2), Logan Jarrett (1), Carson Short (5). Heat Moments: After a pair of spins negated the start of the first heat and then Ketcham and Harris spinning in turn four two laps later, the balance of the dicey heats ran off without incident. “C” Main Winner (starting position in parentheses): Brian Karraker (2). “C” Main Moments: After pole starter Brandon Morin spun at the start and collected others, it was all Karraker. “B” Main Winner (starting position in parentheses): Kevin Thomas, Jr. (2). “B” Main Moments: Isaac Chapple battled past KT for the lead early before handing it back on a lap 8 restart after Daylon Chambers spun in turn two; One lap later, Chapple got out of shape exiting two with Donny Brackett getting upside down in the battle for second gone awry just as Dave Darland and Aaron Farney had turned up the fire on Max McGhee for the final transfer; Into a transfer position after the Brackett flip, Farney denied a last-lap bid from C.J. Leary for sixth. 6 Laps – Jeff Bland and Tyler Thomas tangle in turn four. PROSOURCE QUALIFYING: 1. Josh Hodges, 74x, Hodges-13.319; 2. Chad Boespflug, 98E, NineEight/EZR-13.367; 3. Kyle Cummins, 3R, Rock Steady-13.416; 4. Chase Stockon, 32, 32 TBI-13.462; 5. Brady Bacon, 69, Dynamics-13.495; 6. 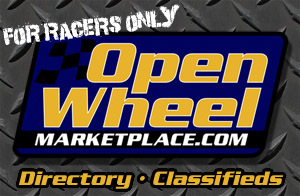 Kevin Thomas Jr., 4J, 4J Motorsports-13.497; 7. Jarett Andretti, 18, Andretti-13.510; 8. Carson Short, 21, Short-13.549; 9. Aaron Farney, 15F, Farney-13.601; 10. Jon Stanbrough, 66, Amati-13.660; 11. Dakota Jackson, 3, Jackson-13.677; 12. Tyler Thomas, 04, Burton-13.725; 13. Tyler Courtney, 23c, TOPP-13.742; 14. Critter Malone, 7, Seven LLC-13.743; 15. Isaac Chapple, 52, LNR-13.782; 16. Max McGhee, 17, McGhee-13.785; 17. Robert Ballou, 1, Ballou-13.793; 18. Thomas Meseraull, 24, LSR-13.812; 19. Chris Windom, 5, Baldwin-13.854; 20. Donny Brackett, 4B, Brackett-13.855; 21. Brady Short, 11p, Pottorff-13.910; 22. C.J. Leary, 17GP, Dutcher-13.931; 23. Logan Jarrett, 29, Jarrett-13.963; 24. Jeff Bland Jr., 38, Bland-14.066; 25. Tom Harris, 5E, East-14.069; 26. Dave Darland, 11, Walker/Curb-Agajanian-14.184; 27. Jamie Williams, 31, Williams-14.208; 28. James Lyerla, 11x, Lyerla-14.216; 29. Riley Kreisel, 90, Smith-14.262; 30. Dallas Hewitt, 69R, Pearson-14.273; 31. Kent Schmidt, 5k, Schmidt-14.277; 32. Brandon Morin, 98, Morin-14.305; 33. Brian Karraker, 23k, Karraker-14.377; 34. Daylan Chambers, 4c, Chambers-14.387; 35. Bret Mellenberndt, 97, Mellenberndt-14.453; 36. Brandon Mattox, 28, Mattox-14.495; 37. Aric Gentry, 10, GBR-14.705; 38. Cole Ketcham, 41k, Ketcham-14.824; 39. Robert Bell, 71, Bell-15.923. FEATURE LAP LEADERS: Laps 1-30 C.Short.